From 2 ½ inch wide to any custom width (up to 42 inches wide in stock), our Premium Velvet Ribbon is the go-to for holiday decorating. This velvet ribbon doesn’t just come in holiday red, but in a variety of colors to match your personal decorating preferences. Add an extra touch of pristine with the wired edge trim. Wrap it around your white poles, hang it from ceilings, wrap your building it in to look like a present and more! If you want the glamor of Velvet Ribbon, but also want it to be custom printed with your branding, then look no further! Our 4 inch wide Velvet Ribbon can be customized with your logo or text (EPS or Ai files only). Is there a candy more associated with Christmas then the candy cane? This ribbon truly helps people get into the holiday spirit. Available in 2.5 or 4 inch wide widths. If you prefer a more whimsical candy cane pattern, that brings out the feeling of a winter wonderland, try our Candy Cane Mountain Ribbon. 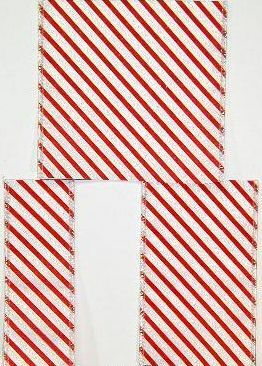 Our Sparkle Candy Cane Wired Edge Ribbon is also available and adds a sprinkle of glamour to the candy cane pattern. If you’re someone who always is looking to bring good tidings, this Holiday Cheer Ribbon is what you need! 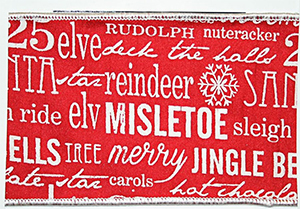 Printed with many key Christmas words, this ribbon can be used for multiple decorating needs. From the tree to the dining room centerpiece, this 4 inch wide wired edge ribbon is sure to wow your guests. Are you someone who embraces the winter snow instead of wishing it would go away? Show it in your decorating this holiday season! We have a few different styles of snow-covered ribbon. 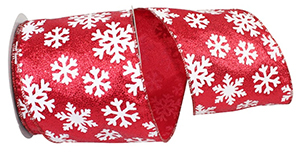 Our Red Glitter Snowflake Wired Edge Ribbon is very festive and can make your holiday wreaths a real talking point. 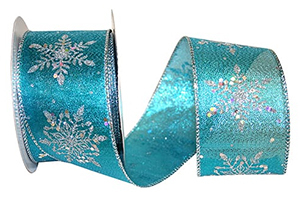 We also have a very elegant Snowflake Sparkle Wired Edge Ribbon. Available in three colors, this can match a variety of different decorating styles. The Christmas Magic Wired Edge Ribbon is a bit more whimsical but will bring out your guests’ inner child with its festive design. 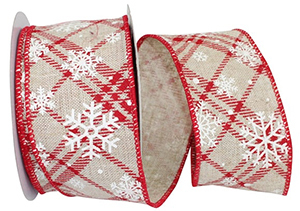 And last, but not least, we have our Snowflake Covered Red/White Lattice Plaid Ribbon. This is a unique twist on the traditional plaid ribbon that is associated with the more rustic or country Christmas – which welcomes us home. 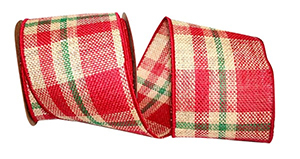 As we discussed in our Bows Guide, holiday decorating trends are shifting to the old school style of the tartan plaid. This 4-inch-wide ribbon looks great on the holiday dinner table, outside on wreaths, around your front door, winding down the staircase, over the fireplace mantel with garland, or even as an exquisite gift box topper. If you want to keep your Christmas List kept safe and tight, use our Dear Santa Wired Edge Ribbon to make sure only Mr. Claus finds out who’s naughty or nice. Besides keeping your gift check off list safe, this ribbon is perfect for topping presents, decorating around the fireplace, or to show Santa where the cookies and milk are. 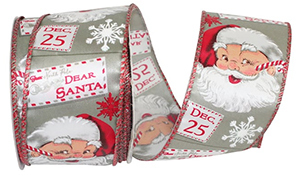 We also have a great alternative with our Santa Belt Buckle Wired Edge Ribbon. If you grew up where there were snow days, then you’ve made plenty of wonderful snowmen. Bring back those memories with our Snowman Stitched Wired Edge Ribbon. The embroidered snowman really stands out, making for a great reminiscing talking point. 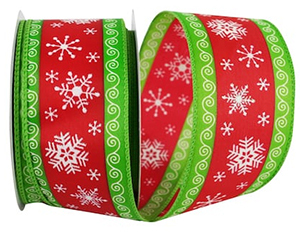 You can also bring out the holiday magic (also known as nostalgia) with our Scarfed Snowmen Wired Edge Ribbon. This ribbon alternates between a familiar top-hatted snowman and a Christmas hat wearing snowman. If you don’t like any of these patterns, or you have your own brilliant idea to perfect your holiday decorations, then our Custom Printed Christmas Ribbon is exactly what you need. This ribbon can be customized with your own Christmas design, business logo, or text (Ai or EPS files only). If you know what you want but don’t have the artwork, we can set that up for you too! Available in 1 inch wide and under an any section amount in 1 inch, 2.5 inch, 4 inch, 6 inch , 8 inch, and 12 wide ribbon widths. Personalizing a present for someone special in your life will always add an extra touch of love and delight to your gift exchange. 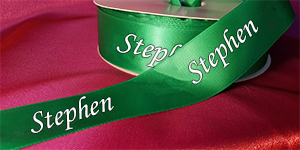 Our Personalized Name Holiday Ribbon can be used to wrap around the present or to make a bow to put on top. This is one of the best ways to show your loved one just how much you care this holiday season. These amazing ribbons are just a few that bring out the holiday spirit. You can check out more of our ribbons here (link). After reading this and our guide to bows, you should be an expert on how to become the best holiday decorator in your business district or neighborhood. If you don’t see what you are looking for, we can help, and we always beat or match any prices. You can call us at 1.800-378-3630 or contact sales@goldenopenings.com. We will have one last installment in our series, where we will discuss all the miscellaneous items that can be used to show your holiday cheer to your co-workers, family, and friends.